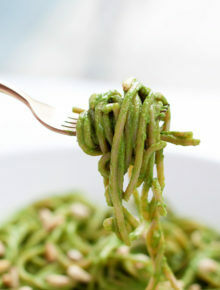 Only 20 minutes and a short list of ingredients and you have an entirely plant-based, utterly creamy, vibrantly green, and absolutely delicious pasta on your hands. And in your mouth. Quick, put down the green food coloring! With all the amazing naturally green foodstuffs out there, there’s no need for that stuff, nuh uh. 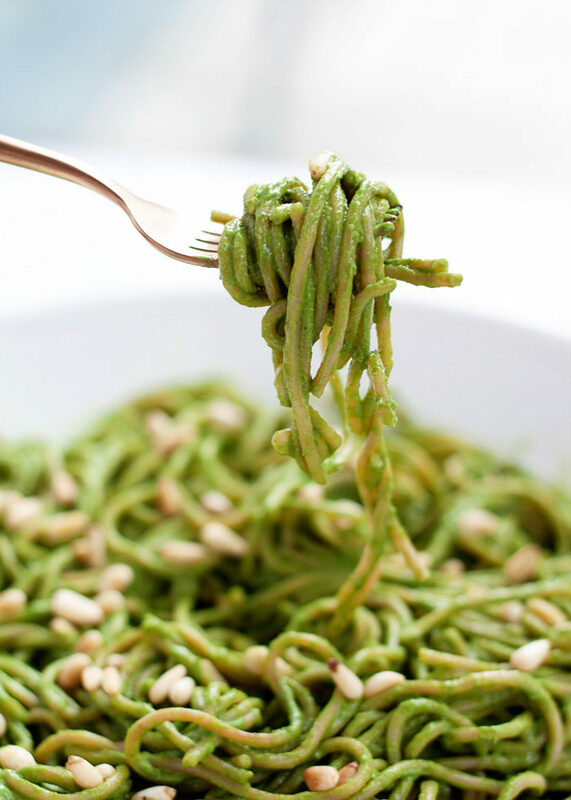 This Creamy Avocado Kale Pasta is about as green as green can get. This stuff and a tossed salad and you’ve got a gloriously green dinner for Saint Patrick’s Day. Bonus: It’ll be on the table in 20 minutes. No joke! 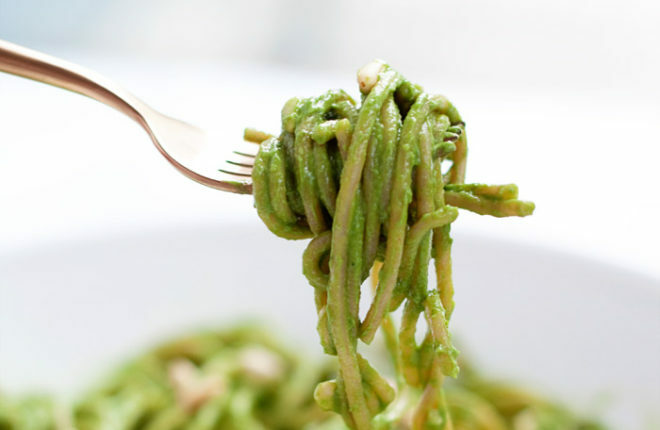 This creamy avocado kale pasta is a riff on that one. I removed a couple of ingredients (basil and olive oil) and added to it (lots of kale and a smattering of pine nuts). 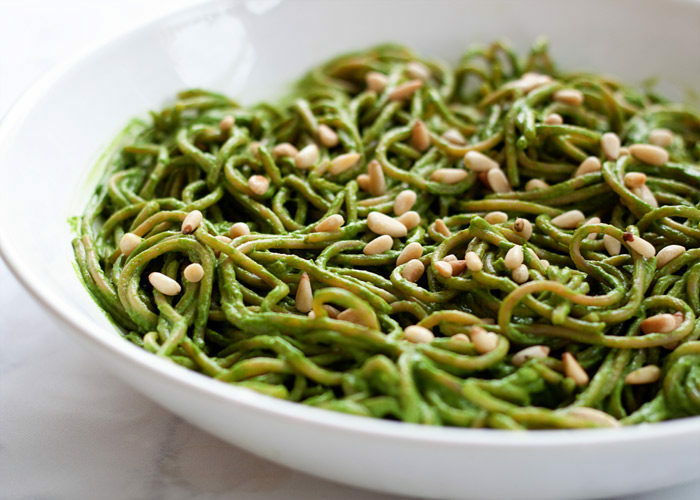 The result is an utterly emerald pasta dish that I definitely do not reserve just for St. Patrick’s Day. It’s an all-the-time thing around here. Cook pasta according to package instructions. RESERVE 1 CUP OF THE WATER YOU COOKED THE PASTA IN. While the pasta cooks, toast the pine nuts. Place in a skillet over medium heat and cook, stirring frequently, until just beginning to brown, about 3 minutes. 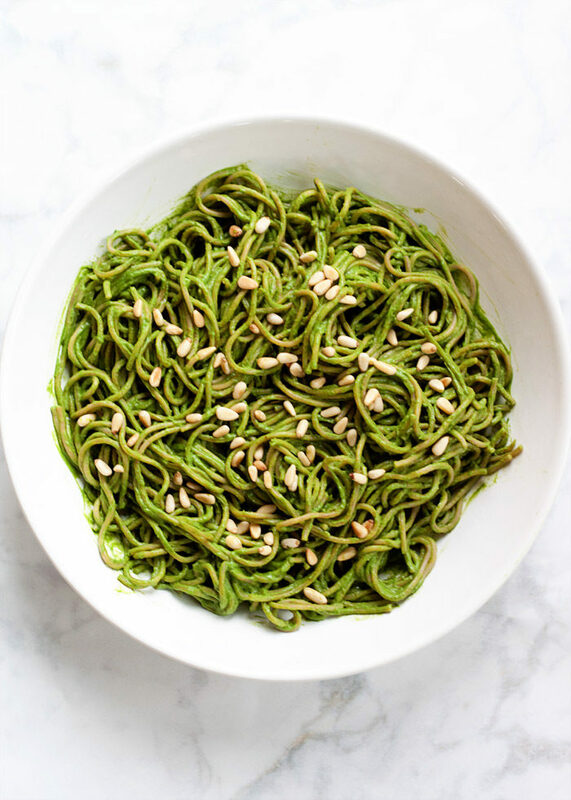 Add 2 tablespoons of the toasted pine nuts to a pitcher of a high-powered blender along with the avocado, kale, garlic, lemon juice, crushed red pepper flakes, and 1/2 teaspoon salt. Add 1/2 cup of the pasta water. Puree until completely smooth, adding more water, about 1 tablespoon at a time, if needed to keep it moving. Add cooked and drained pasta to your serving bowl. Pour the avocado-kale sauce over the top. Toss to combine. Top with remaining pine nuts. Serve immediately. We have found that this recipe does NOT keep well – so be sure to eat it all when you make it! I know – tough job, but somebody has to do it. Top carnivores’ portions with a few slices of grilled chicken breast. Swap in your favorite gluten-free pasta. I love brown rice pasta.